Just three easy ingredients are needed to make these delicious, customisable oatmeal bars! 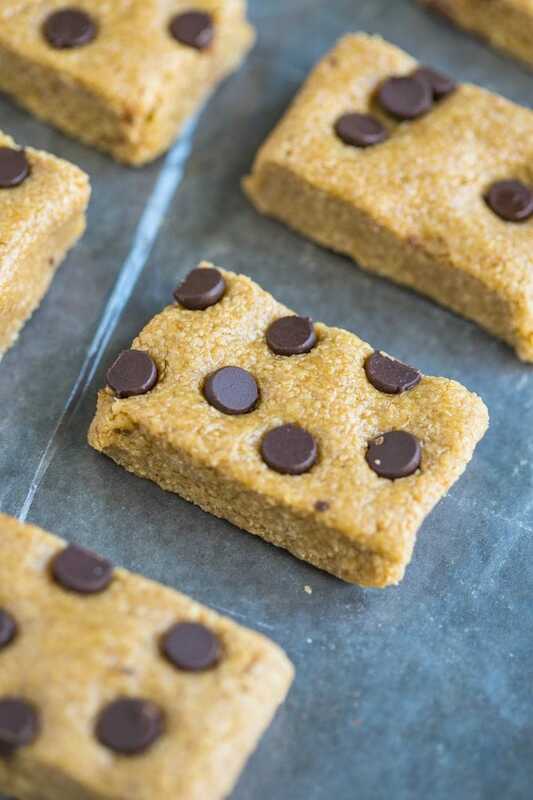 Tested out using various sticky sweeteners, these bars take less than five minutes to whip up and are gluten free, vegan and allergen friendly- The perfect lunch box snack or anytime healthy treat! Today is my first post as part of my collaboration with Kohl’s that I introduced to you guys in this post. In that post, I discussed how I’d be sharing easy, quick and delicious recipes which could be perfect for lunch boxes or snacks to have on hand and I’ve got a super simple, delicious one to share with you today! When I was a kid in primary and high school, food allergies were prevalent. However, when it came to food related allergies, there wasn’t very much in place. If I remember correctly, there were a few peanut allergies, one or two allergic to dairy and someone allergic to me. Yes, Niki claimed to be allergic to me. Luckily for her, the only way to prevent her experiencing any form of turmoil was to keep quiet and eat pie. Minus the pie. These days, it seems that allergies and food intolerances have increased in such large proportions, schools and education facilities have gone to lengths to prevent any potential negative consequences. Something that has been put in place amongst many schools are complete nut bans on any food products served and brought to schools. Long term readers know I have a ‘thing’ for no bake bars/balls/bites/insert APPROPRIATE B word of choice here. However, most, if not all of them, contain a nut butter and/or nuts in some form. These days, it is rare to come across cost effective snack bars or bites which is not only cost effective, but allergen friendly too. Today, I’ve got you guys covered and perfect to pack in your lunch boxes or stored on your kitchen counter for easy snacking. These Three Ingredient No Bake Oatmeal bars are ridiculously easy, delicious and perfect for little (or big!) hands to help out in the kitchen. No fancy gadgets are needed and just 10 minutes to all whole batch of these delicious bars. I’ve tried these out several times using different grain base, different sticky sweetener and two types of allergen friendly spreads- Sunflower seed butter and soy nut butter. I prefer the sunflower seed butter but either option works well. Of course, you could stick to any nut butter but this makes them non allergen friendly or best for home consumption. PS- Side note- If you notice a slight green tinge in the bars, blame the Sunbutter. 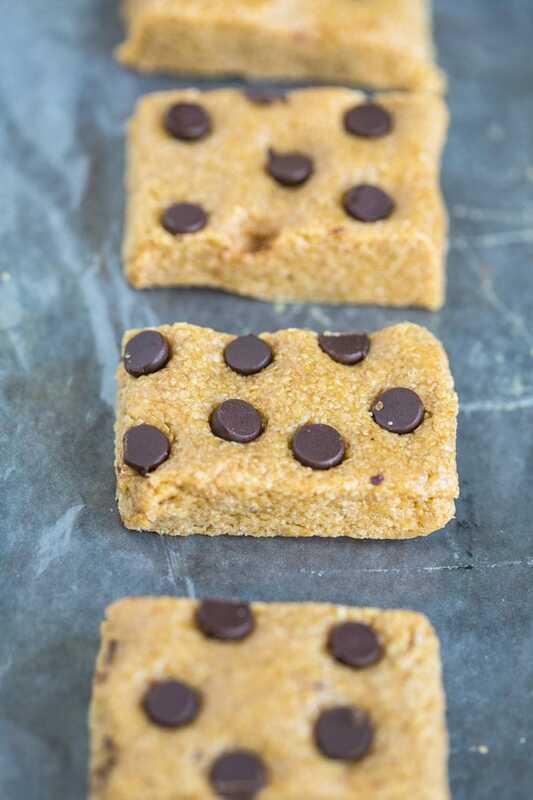 Make these healthy three ingredient no bake oatmeal bars and #makeyourmove…to the kitchen. Oh, and to sensible (allergen free!) snacking! Line a deep baking tray or pan with grease proof paper and set aside. In a large mixing bowl, add the oat bran and set aside. In a microwave safe bowl or stovetop, melt the sunflower seed butter with the brown rice syrup until combined. Transfer the mixture into the lined pan and press into it firmly. If desired, top with chocolate chips or fruit etc and then refrigerate for at least 30 minutes to firm up. Bars can be kept at room temperature covered for up to a week or refrigerated/frozen for up to a month+. Need some other allergy friendly lunch box ideas? I have you covered! Are you allergic to anyONE? What was a childhood snack you had growing up? My kids can’t bring nuts into their classroom for snack and these looks great to try as a homemade option 🙂 I have no food allergies but might have a few people allergies, you bring up a good point! Thanks so much, Michele- IT’s crazy how things have changed! These are great for kids to bring to school since most schools now are going nut free. I do have some allergies including almonds and walnuts which gets really annoying! It’s not a severe nut allergy but I do need to be careful. When I was a kid, I didn’t know anyone who had food allergies. Now it seems like everyone has one! I’m very lucky that I can eat whatever I want. These look delicious and crazy easy! I definitely thought I was allergic to my older brother at times when I was growing up, but it turned out that I was only allergic to grass/dust/pollen. I still avoided him at all costs though. I love easy/no bake recipes! Keep them coming! Thanks so much, Heather- Appreciate it! Hahaha…”Keep quiet and eat pie. Minus the pie.” I love it! I just got back from visiting my sister, and I would have loved to use that line on her. Also, these bars look awesome. I’ve never used sunflower seed butter before, but I am totally intrigued. I need to check it out. And then I need the pie that Niki didn’t eat. With your sister, I would have kept my mouth shut…Those desserts!!! (I may have stalked her IG). Loving these oatmeal bars Arman! My kids will too. Can’t believe they are only three ingredients. Delicious! I’m allergic to people who are allergic to peanut butter. Kidding, of course. I guess I could live off of sunflower seed butter or almond butter while sneaking spoonfuls of peanut butter in a bush somewhere. But seriously, these look mighty tasty. Hooray for three ingredients! Peanut butter is allergic to you. You said you’ve never had a boyfriend before. I just ran out of the fudge. Okay I just ate 4 pieces of fudge for breakfast and need substitutes now. I love that you used sunbutter as this is the only nut butter I still have at home. Yes I completely ignore that sunflower seeds are no nuts. Luckily I am not allergic to any nuts or seeds so I can afford the ignorance! YAYYYYY 😀 And tomorrow’s recipe….have peanut butter ready. Allergic….yes….to gluten (is that even an allergy? ), dairy, eggs, soy, apples, oranges. mangoes, cocoa, coffee, seafood, and intolerant to all types of sugar minus agave and stevia. HELP! But I did used to tell my parents that I was allergic to a popular hardware store chain here in the USA. I used to sneeze every time I went in there so my sis was convinced too! Oh wow hope that it works out- No sugar? Dang! Yum! These sound great and I can’t believe how simple they are! 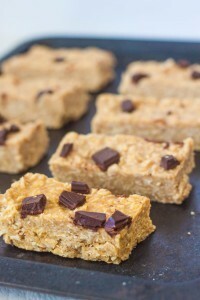 No Bake… 3 ingredients… Oat Bars… could this recipe be any more perfect?? I think not!! Making them this weekend. Thanks so much, Elizabeth- Hope you try it out! these look like something I can whip up because #sweettooth. When are you coming to Dallas? That’s so good- A life without nuts is delicious! Come visit NYC! Right? I’ll never forget the first time I made muffins……and I thought I put spinach in it! Sadly, I am allergic to dairy, but I would be devastated if I were allergic to nuts! I do love sunflower seed butter, so I will try these as is! Haha – too funny Nikki claimed she was allergic to YOU! I’ve have a co-worker who says that to me – guess I shouldn’t share these bars with him! These sound perfect for back-to school snacks or even after school treats! No allergies for me, however I actually do love sun butter! Love how simple yet tasty this recipe is, perfect for anyone :)! It seriously scares me how prevalent food allergies are in schools these days! I worked at a day care for over a year and seriously would go around pouring 10 different kinds of nut milks, soy milk, 2% etc. then go down the line of who is gluten free, who is pork free, who has to be put on a lockdown from nuts (can you imagine if i was allergic to nuts =l) It also frightens me that people think it could be the GMOs/artificial things that are leading to allergies and disorders like autism and AHHH WHAT IS THE WORLD..
WHAT? that is insane how things have changed! I swear life was so much less complicated as a kid. It’s ‘funny’ how almost all bloggers overseas seem to know the banning of certain foods for allergy reasons. That was never an issue around here. 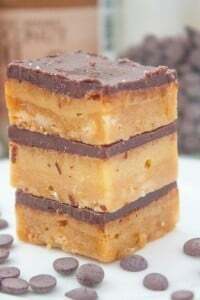 Nonetheless, I’m sure the simplicity and low cost of these bars has the potential of convincing many parents to prepare their own bars instead of going for sugar-laden storebought ones. I always have these ingredients on hand so it would def be so easy to make these in my college apartment! I agree that food allergies have grown a big deal in the last decade, in elementary school my bff was allergic to peanuts and there was a serrate lunch table for those kids who were allergic to peanuts, now there are so many more allergies wheat, dairy, eggs and things you would never think people would be allergic too! Oh wow- I have heard about the separate lunch table shenanigans. I swear with all these new foods, more allergies become prevalent! You’ve got some serious geometry skills, as in those bars are so perfectly shaped! And the look delicious. Lots of allergies! Which is why I love that schools are actually making cafeterias safe for kids with them. 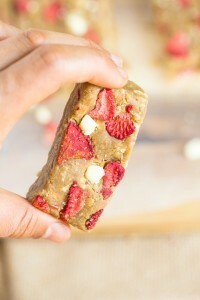 These bars look amazing– sun butter is my fav! Sunbutter is SUPER tasty. I don’t really buy it though, cause I don’t have much of a budget for it. However, next time I do I will try this. YAYAYAY!!!! Agreed! Make your own. That way you can also flavor it however you’d like… add cinnamon, yum! YES! Cinnamon would be a great addition! OH MY GOD IS THE SUNFLOWER BUTTER?!?! 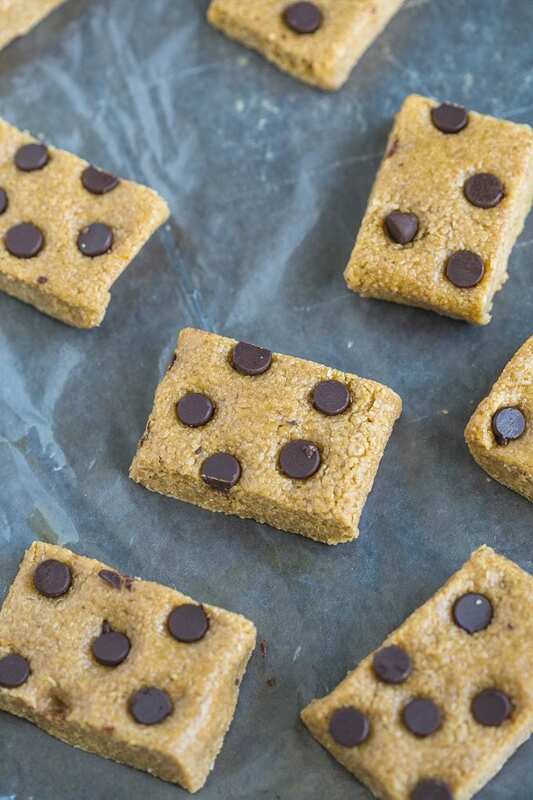 The last recipe I made were sunflower butter chickpea blondies…and they turned GREEN in the oven! I thought it was the imitation vanilla I used X-) Why does it do that?! I need to research this! Thanks Arman! Thanks for this simple recipe Arman! Hey these are perfect for me! It would be a calamity! I love that you use sunflower seed butter in this recipe! What a great idea and what a nice addition of flavor. Thanks so much, Linda- If only they didn’t give the green tinge! Love your blog and the recipes I’ve tried so far, but after making a couple of no-bake bars with sunbutter, I’ve discovered I don’t really like it. I find the texture too dense and rubbery. Perhaps its because I used a jar variety and didn’t make my own from sunflower seeds? I’m not allergic to peanuts but I try to stick to paleo/primal as much as possible. Would love to see your version of a paleo fig cookie/pastry. Hi Cassidy! If you plug the information into a calorie counting website, it will provide all the information you need 🙂 Once you cut them into your desired bar size, you can calculate each individual serving size based on that 🙂 Enjoy! Looking for an alternative to brown rice syrup. Do you think honey would do the trick? Hi! How many bars does 1/2 cups gluten free oat bran (Can sub for rolled oats, quick oats or oat flour, however see notes), 1/2 cup sunflower seed butter (Can sub for soy nut butter or nut butter of choice if not allergen specific), 1/2 cup brown rice syrup (can sub for any sticky sweetener however see notes) make? What size of pan would you recommend for this? Thank you! Hi there. These look great, but I would like to know approximate yield. Planning to make this as part of a preschool class cooking project. If you used a 8 x 8 inch pan, I would imagine that the recipe will yield 16 bars. I’m planning on buying the ingredients, but the preschool teachers will direct the kids in making them, so I would like to give them clear instructions. Thanks! Thank you! The kids at my son’s preschool loved eating these as much as they did making them.